Previous post: Put these books on Kindle already. Next post: What the HELL was I thinking? Not to be confused with Samuel Johnson, who wrote the dictionary, which I always do. No, this book is a biography of Samuel Pepys, who wrote the Diary. An up-from-nothing country boy, Pepys’ abilities and high-placed relatives put him at the center of English history for the last half of of the 1600’s. He witnessed the execution of Charles I, rose high in Cromwell’s administration, turned his coat when Charles II was restored to the throne and rose even higher, and then backed the wrong horse when Charles II died and James II took only four years to whistle his throne down a religious wind of his own making. Pepys, the last man in the world to end his life as a Jacobite, does, out of loyalty and a stubborn determination to turn his coat no more. The shamelessness of his self-observation deserves to be called scientific. and then places his words alongside the narrative of those years. Tomalin isn’t above inserting the occasionally acid and always enjoyable editorial comment, either. Almost the first advice Pepys got when his promotion was known was from a sea captain telling him how to fiddle his expenses by listing five or six non-existent servants when he went on board and claiming pay for them all. It made an interesting introduction to the workings of the navy. Pepys, in one of his most famous formulations, wrote that Major-General Harrison looked “as cheerfully as any man could do in that condition.”…Pepys did not devote the rest of his day to higher thoughts any more than one of us, turning from famine or child murder on television, remains sombre an hour later. Due to his high office and connections at court Pepys’ had a front row seat to all the goings-on, and as secretary to the British Navy a not inconsiderable hand in affairs himself. On every page you aren’t bumping into royalty, you stub your toe on someone out of the Who’s Who of British science and literature, John Milton, John Dryden, Andrew Marvell, Christopher Wren, Isaac Newton, Robert Hooke, and many more. In the meantime, through Pepys’ eyes we singe our eyebrows on the Great Fire of London, and fear for our lives from the plague. It’s a marvelous you-are-there. 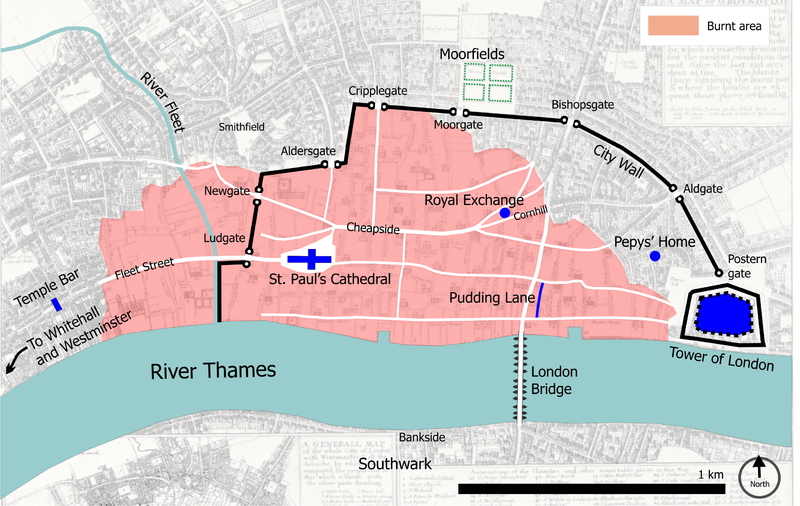 And I found a map of the Great Fire of London on Wikipedia. I have walked those streets, all unknowing.